As usual, there are many new technologies and innovative products at CES 2018. For me, the one that stood out the most on day one was the near-perfection of HDR. Even more than 4K itself, HDR has been the biggest advancement in image potential in many, many years by expanding the color and range of detail and exposure from deep blacks to detail in all but the most extreme highlight. It’s been hard to imagine a time in the future when displays could even get close to the full HDR specification of 0 to 10,000 nits. Keep in mind that even the brightest outdoor images like electronic billboards are only around 6,000 nits and are far from 4K HDR when it comes to resolution and dynamic range. Well, I have seen the future today and it was an actual working LCD display. Only it wasn’t just 6,000 nits – it was the full 10,000 nits. And it wasn’t just 4K, but 8K, and it was an 85″ panel from Sony! Yes, it was spectacular, and even next to a Sony Z9 series panel, which many consider is the best HDR display made, it made an impression. Brighter, more vivid color, extreme detail, and by far and away the best dynamic range I have seen in any display, including OLED displays. How did they do it? 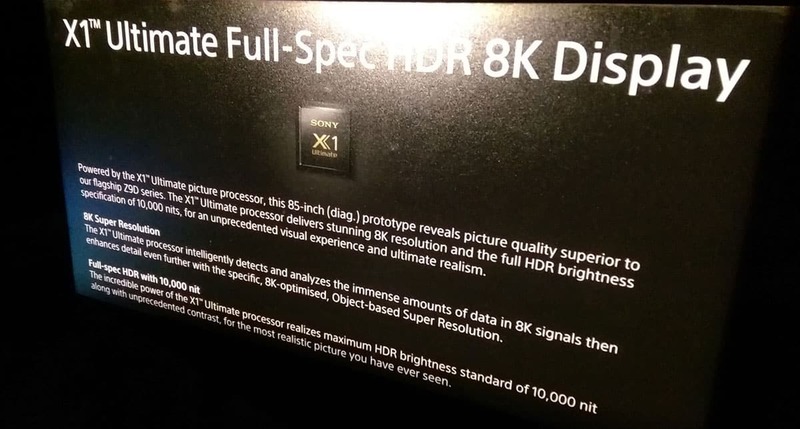 Sony says it is in no small way attributed to their new processing engine they call the X1 Ultimate which processes every pixel and has the most power of any processor used in a consumer TV built by Sony. To put this dynamic range in perspective, keep in mind that a typical consumer TV, and even some pro displays, have a typical brightness of 350 nits. However, most 350 nit LCD panels cannot go down to 0, or near true black. This panel not only can go down to near 0 with very exceptional blacks, but highlights can go all the way to the full 10,000 nits making this a very unique and spectacular viewing experience! 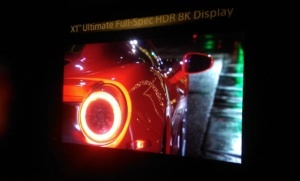 A normal camera, and certainly not an image over the internet, can not begin to capture the full color and dynamic range of “Full-Spec HDR” that this 85″ Sony displayed. Note the taillight is so bright my camera could not expose it and the rest of the car at the same time. X1 Ultimate picture processor that produces 8K resolution, full HDR brightness specification of 10,000 nits! Did you go to CES? If so, what was your favorite thing you saw on day 1? This entry was posted in AV Solutions and tagged 10000 nits, 85" LCD Display, 8K, Full HDR, HDR, LCD, nits, Sony, Sony 85" LCD, Sony 8K HDR 85" LCD, Sony Z9, X1, X1 processor, Z9, Z9 series.